One problem many parents struggle with is getting their baby to sleep in the crib. Some babies become accustomed to a bassinet in the parents’ room during those first few months of round-the-clock feedings. Others just refuse to sleep anywhere but the baby swing or a parent’s arms. Or a car seat in a moving car. There are lots of habits that we can get into when trying to coax baby to fall asleep. If you’re in this situation, don’t feel bad about it, because (1) you’re not alone, and (2) this is a problem that can be solved. 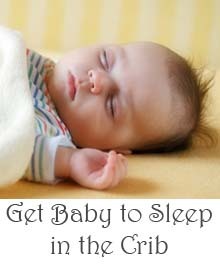 In this article we’ll talk about how you can get your baby to sleep in the crib. Why Should Babies Sleep in A Crib? Sleeping in the crib offers a lot of benefits to your baby, and to you (the parents) as well. Safety. A crib with a fitted, firm mattress and no loose bedding is the safest place for your baby to sleep. This isn’t just my opinion, it’s the position of the American Academy of Pediatrics. Sleep habits. When your baby takes to sleeping in a crib, it becomes comfortable to him or her. In fact, being put in the crib signals your baby that it’s time to go to sleep. Done right, this part of sleep training will come to help your baby fall asleep faster and more consistently. Convenience. This benefit is for you, the parents, because odds are that if your baby doesn’t sleep in the crib, you’re the one paying the price. Maybe you have to lug baby’s favorite swing around. Maybe you have to hold him or let her share the bed. In any case, you’ll get some freedom back when your baby starts sleeping in the crib. Being green. You already have a crib, right? If you never get your baby to sleep in it, that’s a wasted piece of furniture that probably will serve no real purpose in your child’s future. Cribs are meant to be slept in! Do the planet a solid and make sure that wood didn’t go to waste. The crib might be one of the most stylish and versatile pieces of baby furniture that you buy. See our review of 4-in-1 convertible cribs for some great options that convert to toddler and full-size beds. So, your baby won’t sleep in the crib. Why do you think that is? I know many parents who’ve struggled with this issue, and based on my conversations with them, it often comes down to one of a few causes. The Routine. Maybe you got into the habit of rocking the baby to sleep in your arms, but when you go to put the baby down, he or she wakes up and cries. Or your baby can’t sleep without the rocking motion of the swing. The Flat Surface. Some babies seem to have trouble sleeping on flat surface. This may be due to mild reflux, in which case, elevating the head of the mattress slightly could help. The Abandonment. Sometimes babies just don’t want to be alone. Given the choice, don’t you think a baby would prefer sleeping in a bed snuggled between mom and dad, rather than a crib all by himself? If both parents work, then overnights are the one time that a baby can have you both nearby. If your baby won’t sleep in the crib and you think it’s for another reason, please let me know, and I’ll add it to this section. Now let’s talk about the steps you can take to get your baby to sleep in the crib. The earlier you can train your baby to sleep in the crib, the better. We started on the day we came home from the hospital. You probably have a list of great reasons for putting it off, but you need to start working on it now. This is the kind of habit that only gets worse as your baby grows, because they’re stronger, louder, and more stubborn about certain things. They also can move around and get an arm or leg stuck in the bars, which generally causes a tantrum. Plus, the longer sleeping in the crib is not the norm, the more ingrained that habit becomes to your baby. It’s a harder habit to break as time goes on. Finally, you should work on getting your baby to the crib now as a part of general sleep training. You’ll find it easier to establish healthy sleep habits and keep a regular nap schedule. Even better, you might find that your baby (once trained) sleeps longer and more soundly in the crib. All of these are good reasons to begin sooner rather than later. A crib can be a barren place. At first it seems ten times as large as is necessary for your baby. This transition will take your baby out of his or her comfort zone, so you’ll want to make the crib as appealing as possible. Use a crib soother or sound machine to provide some comforting background noise; this has the additional benefit of drowning out the cacaphony of older siblings, televisions, and barking dogs that rule some houses. I highly recommend the Graco Sound Machine for this task, but for more options, see our review of soothers and sound machines. Another good source of white noise is a portable fan. This has the added benefit of circulating the air around the room. You should make the nursery as dark as possible when it’s time for bed. This may require thick curtains and a room-darkening shade for the window. Most babies, like most adults, seem to sleep better in total darkness. One exception that might make your baby happier in the crib is a projection night light. These clever devices project constellations or little cartoon scenes on the ceiling while playing music for a specified amount of time (usually 15-20 minutes). See our guide to Choosing A Night Light for Baby. One way to make your baby feel snug and safe in the crib is to swaddle him or her. You can swaddle your baby with a light-weight blanket such as the very popular Aden + Anais blankets. Or, you can pick up a velcro swaddler, one of the best baby inventions ever. At some point, your baby may outgrow the swaddler or start kicking out of it. At this point, you can transition to a baby sleep sack or sleeping bag. These are essentially “wearable blankets” that allow the arms and legs to move freely. They do seem to make it more difficult for the baby to roll over, and help prevent them from getting their legs stuck between the bars. Getting baby to sleep in the crib, like much of sleep training, will likely make your baby unhappy. Prepare yourself for some crying. I’m not an advocate of the full-on cry-it-out method. Instead, we took the advice of our pediatrician: Let your baby cry for 10-15 minutes. After that, go in quickly to reinsert the pacifier and tuck the blanket back around him or her. Then wait another 10-15 minutes, and repeat. Don’t linger in the room, don’t pick the baby up, just soothe quickly and go back out. This will be hard for you to do, but it may be necessary to get this to work. Plan to do this for a couple of hours until your baby tires out and falls asleep. It may take a few nights of this, but you can do it. And there’s no lasting harm in letting your baby cry; don’t let anyone tell you otherwise! 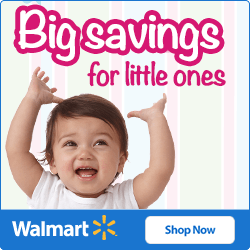 If your baby is accustomed to sleeping in your bed or room, this solution might work better for you. You can get a bassinet or mini crib and keep it next to your bed. This is especially useful if your newborn wakes up to eat in the middle of the night. It’s safer, though, because your baby has his own little space to sleep in. And it makes them more comfortable sleeping in a crib, for when you make the transition to their own room. See our mini crib reviews for recommendations of the best mini cribs and bassinets. Getting ready to take your baby on a trip? Don’t forget to pack something for your baby to sleep in. See our portable travel crib reviews for some options in light-weight, travel-friendly cribs and bassinets. My last piece of advice is this: don’t go cold-turkey. Start making the transition one night out of three, then every other night. This gives your baby some time to adjust, and lets both parents and babies recover a little bit on off nights. During the day, you can alternate naps (one in the crib, one wherever they’re most comfortable). Work your way up gradually to 100% crib over the course of one to two weeks. 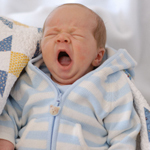 Baby sleep problems takes you through the most common sleep issues and how to address them. 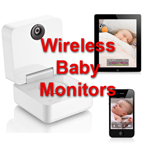 Our video monitor reviews compare the latest cutting-edge wireless color video baby monitors. 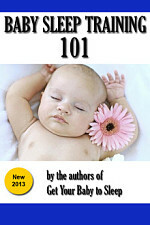 Visit our sleep training section for strategies and tips for teaching your baby to sleep through the night. 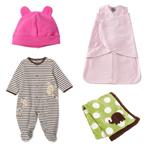 Check out our reviews of Essential baby gear for helping babies sleep at night. If and when you got your baby to sleep in the crib, and have some advice, please offer it in the comments section below!